In roaming about Ex Astris Scientia one day, the Borg species list caught my eye. Janeway: "I'm curious. When did the Borg discover Omega?" Seven: "Two hundred twenty nine years ago." Seven: "Yes, of thirteen different species." Janeway: "Thirteen . . ."
Seven: "It began with Species 262. They were primitive, but their oral history referred to a powerful substance which could 'burn the sky'. The Borg were intrigued, which led them to Species 263. They, too, were primitive, and believed it was a drop of blood from their Creator." Seven: "Yes, but irrelevant. We followed this trail of myth for many years until finally assimilating a species with useful scientific data. We then created the molecule ourselves." "The Omega Directive" occurs in 2374, and thus we can do the math . . . 2374 - 229 = 2145. Let's take a brief moment to ponder this further, since this fact might be useful. Of course, we first must ponder just what Seven took "discover" to mean. She could've been referring to the assimilation of the "useful scientific data" or the creation of the molecule, after all, as opposed to the simple mythological reference to a sky-burning substance. However, the most straightforward interpretation is that the assimilation of 262 and their first inkling of Omega was in 2145. Further, we have no evidence of there being a significant geographic quality to the numbering scheme. Simply using encounters with Alpha Quadrant species is insufficient . . . some of the higher-numbered species from the Borg list are still in the Delta Quadrant, giving us little geographical rhyme or reason. I would posit that in most if not all cases, Borg species numbers are assigned based on assimilation of individuals, unlucky vessels, and so on, as opposed to numbers usually being assigned during abrupt assimilation of entire cultures. This seems to be confirmed by the Talaxians. In "The Raven"[VOY4], Seven referred to Neelix as a member of Species 218, noting that a freighter crew had been assimilated. There is no evidence that the entire Talaxian race was ever assimilated. It's worth noting here that although the Borg are often viewed as having all the stealthiness of a bull in a china shop, this actually isn't the case at all. For instance, in 2364 the Borg probed the Federation-Romulan Neutral Zone, perhaps some of the most well-defended and well-monitored real estate in the Alpha Quadrant. There, they destroyed or assimilated bases and outposts on both sides. Neither side had the first clue who did it. Compare that to "Balance of Terror"[TOS1], in which Earth outposts, even under devastating attack by a Romulan ship armed with weapons of extraordinary power, had sufficient time to send distress calls and telemetry. Further, during the first contact with the Borg in 2365's "Q Who? 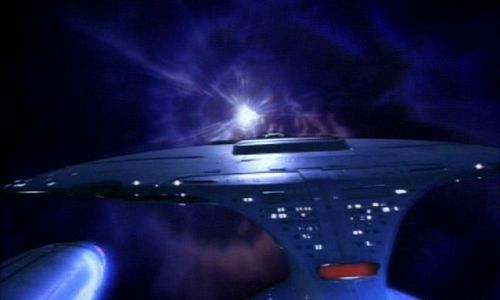 "[TNG2], the Borg ship went undetected until it was already nearby, moving in on an intercept course at sublight. Indeed, had the Borg not used some sort of sensor system which tipped off the Enterprise-D's sensors and led Worf to report they were being probed, they might not have been discovered nearby at all. It seems that only later enhancements or recalibrations performed on Federation sensors allowed them to scan for Borg vessels at significant distances. In any event, however, it seems unlikely that the chronological march from 262 to 263 that Seven indicates could refer an anti-chronological assimilation pattern. Or, to put it another way, I doubt 262 and 263 were met 800 years ago and just happened to both get assimilated back-to-back 230 years ago. So, we're left with the notion that as of 2145, the Borg had encountered only 260-odd species. We know from "Dragon's Teeth"[VOY6] that 900 years ago the Borg existed (a Vaadwuar recognized Seven as a Borg instantly), but with only a handful of systems under their control. This would imply that over the course of almost 670 years the Borg were spreading with surprising slowness. Further, Seven notes in the episode that Borg records from 900 years prior were "fragmentary", implying that some event or series of events happened to the Borg. (Otherwise, we would have to assume that the early Borg were running Windows.) This provides us with a natural cut-off point for our exploration of the Borg . . . anything before circa 1476 is part of Borg pre-history, and even the Borg themselves may have no idea as to their own origins. Indeed, our only pre-1476 data on the Borg comes from Guinan in "Q Who? "[TNG2], who states, with the appearance of some uncertainty, that the Borg fusion of organic and artificial life has been developing for "thousands of centuries" (100,000+ years). For the Borg to have only encountered 250 species over 670 years is remarkable. By the time the Federation was 200 years old, for instance, an individual like Data could encounter 1754 "non-human" species in his lifetime ("Darmok"[TNG5]), and members of hundreds of humanoid species reside on Earth per Harry Kim in "Hope and Fear"[VOY4]. In any case, things changed rapidly at some point after 2145. By 2375's "The Disease"[VOY5], the Borg had references to romantic love in over 6000 assimilated species, giving us a lower limit to the high-count of the Borg species list. Seven: "Species 6339, Humanoid. Warp-capable. Origin, grid one two four, octant twenty two theta. They first encountered the Borg approximately four years ago. Since that time, eleven billion individuals have been assimilated. Three days ago, the Collective detected one of their last surviving shuttlecraft. A Cube was sent to intercept it." This would seem to imply that the Borg species count hit 6339 in 2371, four years before the quote above. However, that cannot be. Why? Because during or prior to 2355 (probably during), we know that the Borg species count was up to a lower limit of 6961, per "Dark Frontier"[VOY5] and "The Raven"[VOY4]. So, by 2355 the Borg had encountered a lower limit of almost seven thousand species. We now have the ability to do some math. For instance, from 900 years ago to 229 years ago (669 years, or from 1476 to 2145), the Borg species list topped out at 262, for an average rate of only about 0.4 species per year. 6961 - 262 = 6699. This means that in the 210 year span from 2145 to 2355, the Borg encounter rate jumped to 31.9 species per year . . . an 8000% increase. It isn't clear what caused the drastic change of rate, or what precisely it means for the Borg. Even the Vaadwuar from 900 years ago considered the Borg to be a plague and apparently knew of the collectiveness of the Collective, but the Borg were obviously different in some way. Incidentally, using these datapoints we can roughly estimate contact dates for a few Alpha Quadrant species. The Vulcans, for instance, are Species 3259. Using the 2145-2355 encounter rate and back-projecting from 2355, the first Vulcan would've been encountered/assimilated in 2247, or about seven years prior to "The Cage"[TOS]. Species 5618 . . . Earthmen . . . would've first been encountered/assimilated in 2321 . . . about 23 years prior to the loss of the Enterprise-C, during the "interregnum" of largely uninteresting time between the TOS movies and the TNG era. 1476 <10? The Borg control a handful of systems in the Delta Quadrant. Considered a plague by the locals, the Borg have already established a collective and are already merging machine and man. Borg of this time period may resemble the somewhat de-Borgified Seven of Nine. 1754 116 The Borg encounter the race of Arturis. They are unable to conquer them for centuries. 1778 125 The Borg first encounter the species from which the later Borg Queen will hail. It is unknown if they had a queen prior to this incident. 1925 180 The Borg encounter the Ferengi. 2137 259 The Borg assimilate automatic regeneration sequencer technology in Galactic Cluster Three, "a transmaterial energy plane intersecting 22 billion omnichordial lifeforms" ("The Gift"[VOY4]). This technology allows self-repair of Borg devices. Given that no omnichordate drones are ever observed (what would that even look like? ), it is unlikely that the species was entirely assimilated. 2145 262 The Borg have assimilated members of over 250 additional species, with at least a few of these species having been entirely assimilated. 2147 329 The Borg encounter a Kazon colony. Mar., 2153 - The events of "Regeneration"[ENT2]. 2247 3259 The Borg assimilate their first Vulcan. 2293 unk. The El-Aurians have been assimilated at some point in the past 38 years, and by 2293 refugees reach Earth. 2321 5618 The Borg assimilate their first Terran. 2352 - Based on tenuous information, a Federation scientist named Hansen mounts a small expedition to locate and study the Borg. He successfully locates the Borg, tailing them and studying them for three years. 2355 6961 Apparently a short time before the assimilation of he and his family, Hansen notes that a particular drone is of Species 6961. Janeway: "B'Elanna, it's clear from the Borg database that they know practically nothing about Species 8472." Torres: "That's right. The Borg gain knowledge through assimilation. What they can't assimilate, they can't understand." Janeway: "But we don't assimilate, we investigate, and in this case, that's given us an edge." In other words, it seems unlikely that the Borg would've been able to make significant improvements to their technology unless they were able to assimilate better tech from elsewhere. We know, for instance, that as late as the 2130's the Borg were still assimilating some of their basic technologies (as viewed from the 24th Century perspective) from more advanced races. Then again, the Borg apparently did do some research on Omega, and had opportunity to "refine [their] theories" on it based on the knowledge gained. And, they designed the Omega containment vessel that Seven recreated, apparently on their own. Further, Future-Janeway noted that the Borg Queen would have scans of the updated armor and weapons that had been brought from the future and would have the Collective working on ways to adapt. This may not imply that new techniques were being used, however . . . during the assimilation of a speces in "Dark Frontier"[VOY5], the adaptation technique employed on the shields to protect the Borg vessels seemed to be a modulation technique that the Borg already possessed. In any case, there must be limits to Borg research. After all, the Unimatrix One structure contains trillions of drones in the 2370's. The raw computational power of those drones, not to mention simple non-biological Borg computing, must be profound. SETI@home or Folding@home or any other @home system would undoubtedly drool at the merest sliver of this capability. To put it more to the point, the Borg could devote the equivalent of entire Federations'-worth of personnel, computational resources, and other resources on pure research. And yet, the Borg have never conquered the Federation with technology . . . if anything, while the Borg have shown a rapid response via adaptation in the short term (i.e. on a per-encounter basis), it's the Federation whose technology seems to be advancing faster. Presumably, the issue is that the Borg are simply not creative in the sense of having inspiration on a conceptual level. They adapt or find limited ways to re-purpose existing technology, but genuine new ideas or new technologies based on analogues to something else will elude them utterly. The issue of restricted warp speed may not totally explain the slow pace of the Borg, however. After all, we do know that the Borg managed to gain access to other dimensional realms, and have had this capability for centuries. From the omnichordate Species 259 of the transmaterial energy plane known as Galactic Cluster Three to the multi-spectrum particle lifeform Species 5973 of Galactic Cluster Eight, not to mention Species 8472 from the transdimensional realm called 'fluidic space', the Borg have been giving our universe a bad name in many dimensions. It is a wonder that these transdimensional wanderings have not provided the Borg with more devastating technologies. Then again, these wanderings may have contributed to the Borg's control of transwarp technology. Alternately, there might've been some cultural change in the Borg. An oddity with them is that the observed Borg Queen/Queens was/were of Species 125, a species first encountered by the Borg some six hundred years ago. It may be that prior to the encounter with 125, the Borg operated as they were originally conceived (and written about nicely in one of the few Trek novels I've read, "Vendetta") . . . simply a collective hive mind of "soulless bastards". This would have them without a representative Queen, who would presumably guide them and give them purpose. It's even possible that the assimilation of Species 125 had unanticipated consequences for the Collective . . . that 125, though assimilated, basically took over the Collective in the form of the Queen. They certainly had purpose by 2145, when they were assimilating anyone who might know anything about Omega. In any case, the troubling thing is that the rate increase only gets worse. As noted, we had a lower-limit species count of just under 7000 by 2355. This implies that the Borg spread out quickly after 2145. But, by the 2370's we hear of Species 8472. In "Scorpion, Pt. I"[VOY3] and "Scorpion, Pt. II"[VOY4], it is implied that this species had been encountered approximately five months beforehand, or in mid-2373. And, in mid-2375, we find that the Borg are moving to assimilate Species 10026 ("Dark Frontier"[VOY5]). Even simply by using the span between 2145 and 2375, during which 9764 species were added to the roster, we get an average of 42.5 species per year. More profoundly, though, by the mid-2370's they would've been at a rate of 777 species per year. This latter rate, though amazing, is dead-firm lower-limit . . . we're given a fairly exact time for the Borg's first encounter with 8472, and know of 10026 about 18 months later. Such an amazing rate is entirely possible given the transwarp hubs, transdimensional meanderings, and all the many vessels of the Borg. That said, it does seem rather contrary to the earlier rates. We already knew they'd sped up greatly after 2145 . . . but why would they speed up again? In "Q Who"[TNG2] and "Best of Both Worlds, Pt. I and II"[TNG3,4], the Borg seemed dependent on warp drive. To be sure, we know that they had transwarp capabilities in the 2350's . . . the Hansens aboard the SS Raven ended up hitching an inadvertent ride to the Delta Quadrant that way, and indeed their first contact with the Borg occurred when a cube dropped out of transwarp right on top of them. La Forge: "Our current theory is that the Borg have established several transwarp conduits through subspace. 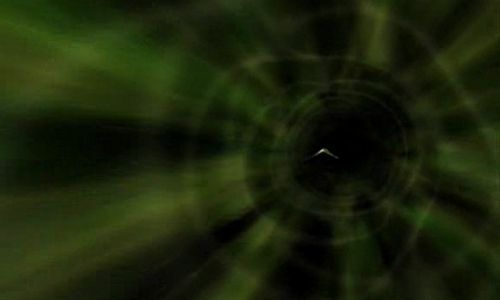 A ship entering a conduit is immediately accelerated to an extremely high warp velocity. It's like falling into a fast-moving river and getting swept away by the current." Picard: "How fast would a ship travel through one of these conduits?" La Forge: "We don't know... normal subspace limitations don't apply to transwarp variables. Based on the distance we covered in our trip through the conduit, I'd say the speed is at least twenty times faster than our maximum warp." Riker: "How do they open the conduits?" La Forge: "The Borg ship emitted some kind of high energy tachyon pulse just before we saw the subspace distortion. It seems as though the conduits are keyed to respond to tachyon transmissions on a specific frequency." 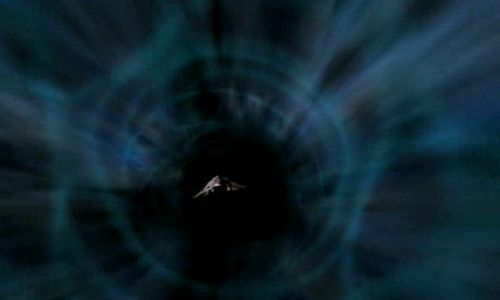 As observed in the episode, a starship with no special equipment could accidentally travel through such a conduit if too close behind a ship that had just used it. Further, we see that even a shuttlepod, if equipped with a tachyon transmission system, could trigger the terminus to open. The Enterprise-D, using the same tachyon transmission, then followed the shuttlepod into the aperture. These transwarp conduits were independent subspace constructs. Whatever apparatus there was that kept the conduits functioning was apparently planted at a stationary point in subspace, presumably by standard warp-capable ship. In other words, it would be like building a road you couldn't use until the whole road was done . . . in order to get it built, you'd have to walk the entire time. Unfortunately, it is unclear just when the Borg gained control of this infrastructural technology. We know they had it circa 2352, when the Hansens accidentally followed a Borg ship through a transwarp conduit. However, it is unclear how long the Borg might've had it before this time. As noted, simply using encounters with Alpha Quadrant species is insufficient . . . some of the higher-numbered species from the Borg list are still in the Delta Quadrant, giving us little geographical rhyme or reason. And, of course, given the way ships turn up missing and/or have ended up on the other side of the galaxy on more than one occasion, a certain amount of transgalactic happenstance must be assumed. In the 2370's, however, we hear of additional transwarp technologies. 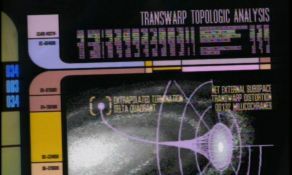 Not only did the Borg have the piecemeal railroad track system of transwarp conduits, but by 2374 they had enormous transwarp hubs (pictured below) and by 2375 they also had tiny transwarp coils for ships. These transwarp hubs seem to be an evolution of the original transwarp conduit technology. Far faster than the original transwarp, the hub-linked-conduits bore a strong resemblance to the coil-based transwarp system, but featured large ring-shaped devices supporting the intersections, and of course the enormous hub facilities. The large ring-shaped structures may be similar to what was already being used by the Borg for the indepedent transwarp constructs. 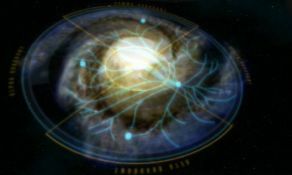 The coil-based system, meanwhile, seemed to serve as a largely independent technique (though one compatible with conduits), suggesting a divergent but backwards-compatible evolutionary tree of transwarp technologies. What's interesting about this evolution, beyond the raw speed enhancement involved, is the appearance of the transwarp domain. To the right, we have the Borg transwarp conduit navigated by the Enterprise-D in 2369. And here, we see the quantum slipstream technology employed by a member of Species 116 in 2374. Here, we see the Borg's coil-based transwarp system in use by the Delta Flyer in 2375. And finally, we see the Borg's hub-based conduit system in use by Voyager in 2377. Obviously, the conduit's appearance is completely dissimilar to that of the 2369 Borg transwarp conduit. The closest match is the slipstream, though the greener-hued Borg coil-based transwarp effect gets an honorable mention. I would posit that the very nature of Borg transwarp conduits changed at some point between 2368 and 2375. Of course, the difference in appearance could be a result of the joining of the old-style conduits in the new hub-based system (assuming such a thing occurred), but even in regards to raw speed there is a profound difference. The 2368 conduit traversed by the Enterprise-D was not extraordinarily fast . . . a mere 20 times greater than the maximum warp of the Enterprise-D, which should leave it in the neighborhood of 200,000 to 400,000c . . . at the former speed, a 70,000 light-year trip would take just a little over four months. However, the speed of the later conduits (and coil-based technique) is far faster . . . the trip in "Endgame, Pt. II" seems to suggest a speed in excess of one billion times the speed of light, though in general a speed in the many millions of c is clearly indicated. At this point, we should stop to ponder Species 116, and the quantum slipstream of Arturis. At the beginning of 2374, Kes had thrown Voyager some 9500 light-years beyond Borg space, which by that point they'd already exited. Even assuming a slower-than-estimated-average pace of 500 light years in the following year, then we have a nice round figure of 10,000 light-years as Voyager's distance from Borg space as of "Hope and Fear"[VOY4]. 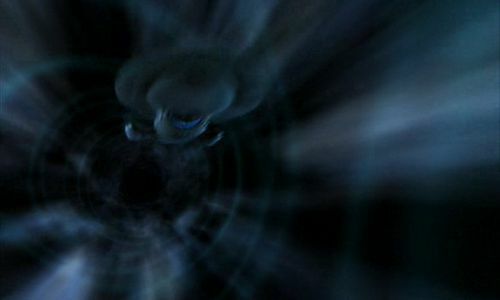 Once Arturis revealed his plot in that episode, he stated that he'd be taking Janeway and Seven to his homeworld, inside Borg space, within a matter of hours. Later, he accelerated still further, and even so Voyager caught up using the same sort of drive system. After rescuing Janeway with less than two minutes before arrival at the 116 homeworld, Voyager remained in the slipstream for an hour, and when the slipstream collapsed the ship had gained 300 light-years on her way home. I note all of the above merely to point out that the quantum slipstream drive was capable of speeds of at least 10,000 light-years per hour. That is 87,600,000c . . . significantly faster than the conduits in use by the Borg in the late 2360's. However, as noted, the later Borg conduits had reached speeds in the millions of times lightspeed. Captain Janeway of Voyager allowed the slipstream vessel of Arturis to fall into the hands of the Borg at the 116 homeworld. It seems entirely likely that the vessel, which we see to be rapidly surrounded by Borg cubes, was in fact assimilated at that time along with Arturis. Its technological distinctiveness became one with the Borg. Once that was accomplished, then, they'd assimilated a propulsion system far beyond anything they were known to be using at the time. I submit that the Borg adapted this technology to their pre-existing transwarp conduits, enhancing them significantly and allowing vessels to blaze their own transwarp trails by way of transwarp coils. And if, for some reason, it seems unlikely that the Borg could've made use of slipstream technology to adapt their own transwarp technology so quickly, think again . . . Voyager successfully conducted a slipstream flight mere days after first encountering the technology, and attempted to conduct another slipstream flight just two months later, in "Timeless"[VOY5]. Both flights were largely successful, but could not be repeated for various reasons. This theory also explains the Borg vessel in late-2373's First Contact. First detected by one of the Deep Space stations on the outskirts of the Federation, the vessel apparently warped to Earth in a manner similar to what transpired during the Borg attack of 2366-7 (BoBW). Such a maneuver would've been pointless had the Borg ship had access to the transwarp conduit terminus less than a light-year from Earth that existed in 2377 ("Endgame"[VOY7]). But, it would make much more sense if that terminus simply wasn't there yet. There are only three potential counterindications I'm aware of. First, Janeway in "Endgame" notes to Seven that according to the latter, the Borg only had six hubs in the galaxy. One might believe, then, that the hub network had been in place since before early 2374, when Seven was separated from the Collective. However, this need not be so . . . in "Dark Frontier"[VOY5], Seven once again had access to the Collective, so the information could easily have come during that time. And, if the connection between the Borg transwarp enhancement and slipstream is accurate, then the hubs could only have come after (a) the assimilation of Arturis's ship, or (b) the assimilation of Species 116. Species 116 was assimilated sometime during 2374, after the Borg-8472 War that Janeway helped the Borg to win. So, in either case, the Borg would've only started their modifications after Seven had been disconnected from the Collective. That leads us to the second counterindication . . . how can we know it was Arturis's ship alone, and not merely the assimilation of 116 that led the Borg to their slipstream-based transwarp enhancement? The answer is simple . . . we can't. However, the only 116-related ship we know of that featured slipstream was that of Arturis, and that's the only vessel we know of as being assimilated with such technology aboard. Further, 116 was an apparently-thoughtful race that had been resisting assimilation for centuries . . . it seems unlikely that they would have no contingency plan for failure besides some crazy bitter guy flying off on his own. The only other problem with this theory comes with "Survival Instinct"[VOY6]. There, we see a sphere crash event from eight years prior, or 2368. Among the survivors is Seven of Nine, who reports that a "transwarp chamber" is reaching critical pressure. However, this does not necessarily suggest that the vessel was capable of transwarp flight, independently or otherwise. Be it a test article, a computer system upgrade, or what-have-you, the unit's role is uncertain. The Borg have existed for no less than a thousand years, but it's only in the past two hundred years or so that they've begun a period of increasingly-rapid expansionism. The underlying cause for this increased expansionism is unclear. It is presumably related to 'cultural' and/or technological changes. What is known, however, is that the rate of expansion increased quite extraordinarily in the period from mid-2373 to 2375, a period of time during which over 1500 species were encountered by the Borg. A contributing factor to this wildly-enhanced expansionism on the part of the Borg is believed to be the introduction of quantum slipstream technology in late 2374. This technology arrived at the Borg's doorstep, in part, due to misdirected vengeance by a member of an assimilated species, and also due to the negligence of Captain Kathryn Janeway of Voyager, who allowed a vessel of profound technology to fall into the hands of the Borg. No attempt was made to destroy the vessel. 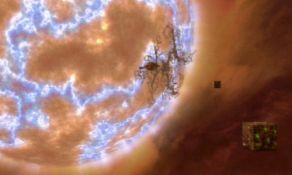 As a result, the Borg were able to produce an extreme increase in their top speed, enabling their millions of vessels to traverse far greater distances in less time than was ever before possible, and at least some vessels to be able to traverse such speeds without recourse to the comparative crawl of warp speed or the infrastructure of a pre-built transwarp conduit network. In short, while Captain Janeway dealt a blow to the Borg by destroying Unimatrix One and a transwarp hub facility in 2377, this serves to only partially undo the assistance she had given them in the Borg-8472 War and related matters. The lasting ramifications on the galaxy are as yet unknown. The concept of deriving a history from Borg species numbers was, alas, not unique. See this thread at Flare, for instance. Special thanks to Ex Astris Scientia.